You can also use TeeChart with FMXLinux to port/build your charting applications to/for Linux with Embarcadero Delphi 10.2 Tokyo. 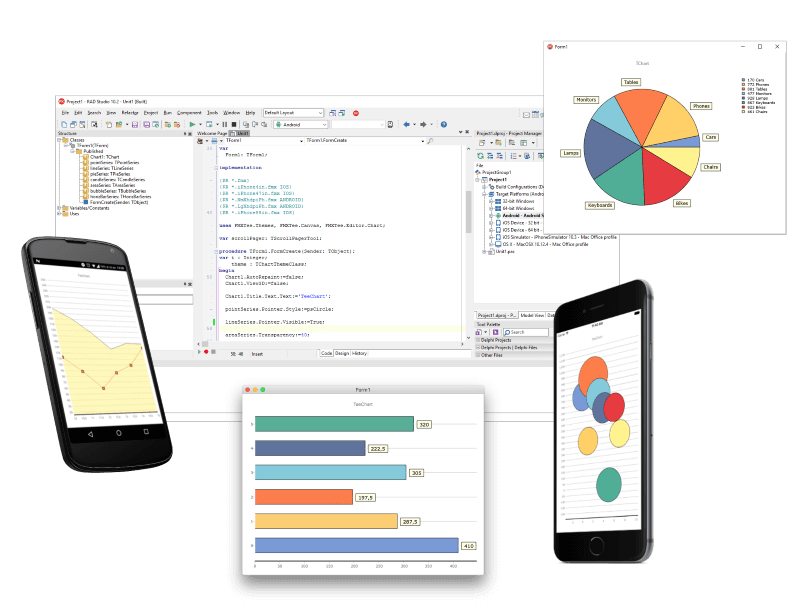 TeeChart offers an immense array of Charts to display your data in the most effective and manageable way. Over 60 Chart types with 2D and 3D views - from common bar, line, area to financial and statistical charts. 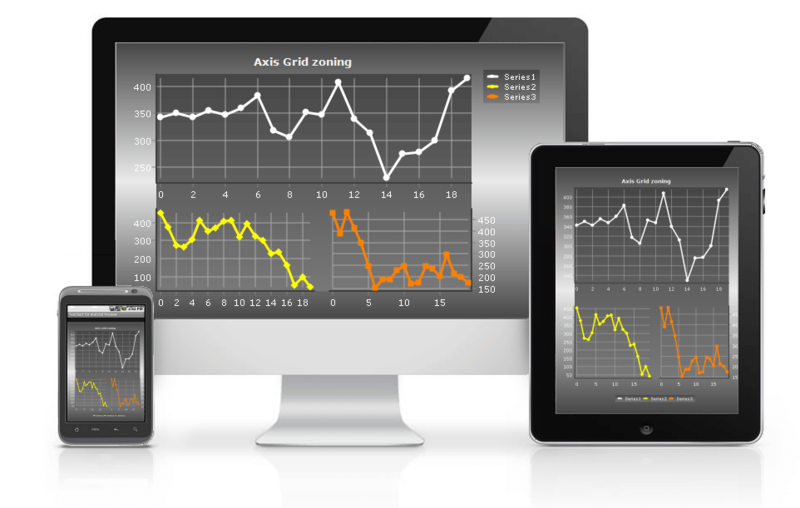 TeeChart offers many Gauges series type and indicators to create digital dashboards with visual effects like shadows, lighting, etc. The demo provides a Dashboard report containing Charts, a Grid and Map. The example uses several TeeChart features in order to interact between the different Chart and Grid, as well as some TeeChart Tools. 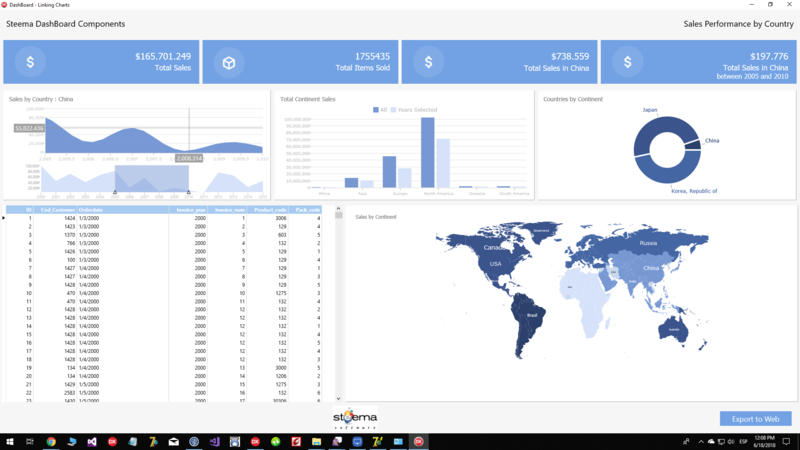 The dashboard represents the sales activities of a company with products in several markets around the globe. Deliver charting applications across Windows, macOS, iOS and Android and Linux platforms. The Area style allows single or multiple areas with different layouts ( 3D, overlap, stacked ). A Polar Chart example displaying implemented Zoom support. With new 'Embedded' property multiple Circular Gauges and/or Linear Gauges can be embedded in a Circular Gauge. Deliver charting applications across iOS, Android, Windows and MacOS platforms. Using a simple linear interpolation formula it's now possible to calculate y=y(x) for arbitrary x value. Full support for Embarcadero Windows IDEs (RAD Studio, Delphi and C++Builder) and FireMonkey framework enabling to compile apps for Windows, macOS, iOS / iPhone and Android. TeeChart can also be used with FMXLinux toolset. 60+ chart types and variations. From the commonly used Line, Bar, Area, Pie to those more “field-specific charts” such as Candlestick, Open-High-Low-Close and Contour. Gauges series type and indicators (Circular, Linear, Numeric, Knob, Equalizer and Combination) to create digital dashboards with visual effects like shadows, lighting, etc. Provides library of map series including maps of the World, continents and countries like USA with custom properties. A quick view at the functions and indicators mosaic. Many 3rd party reporting components and other applications are compatible with TeeChart such as: IntraWeb VCL, ReportBuilder, QuickReport, FastReport, RAVE, etc. You can easily create and/or connect to an existing database or dataset in your project. 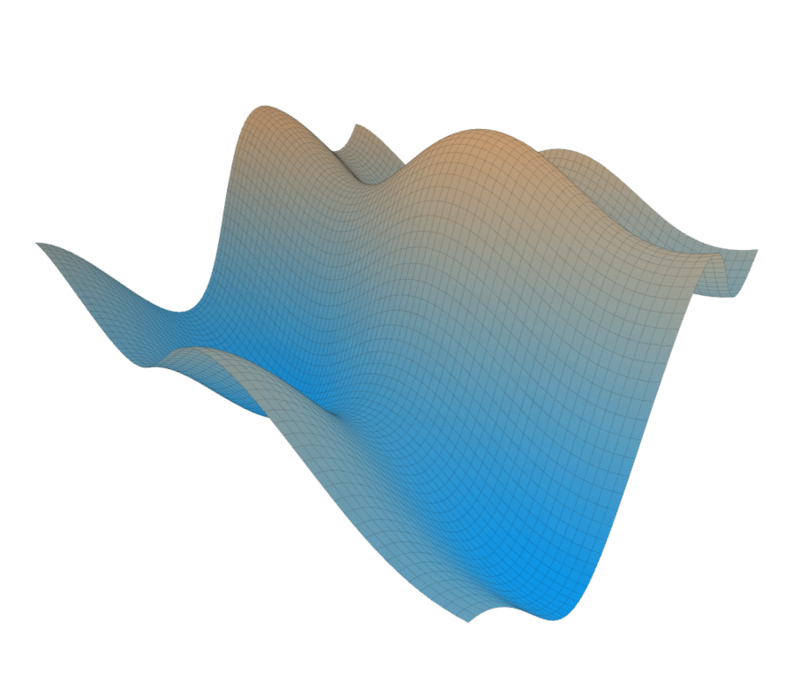 Web source component to retrieve Internet charts and data. Database charting with Summaries, Sorting, Crosstabs and record level. The Palette provides access to 30 toolkit-specific components including ChartGrid, Navigators, Web source and Control Bar. Offers you control over the aesthetics of the charts with a set of 25 image filters. You can easily export charts as images (Flash/Flex, XAML, JPEG, GIF, PNG, BMP, EPS, PDF, PCX, WMF) and as data to HTML, XML, Text, CSV and Excel (xls, xlsx). And export / import native template (*tee). TeeChart Editor dialogues translated to 38 languages. Just one mouse click! The translation can be used at design-time and run-time, and even with your custom application forms and texts. TeeChart fully utilises dynamic arrays of your data, Intel assembler and many speed optimizations. LiveBinding a Chart to a dataset using a TBindDBChartLink component and a BindScopeDB connected to a DataSource. Series are automatically created. 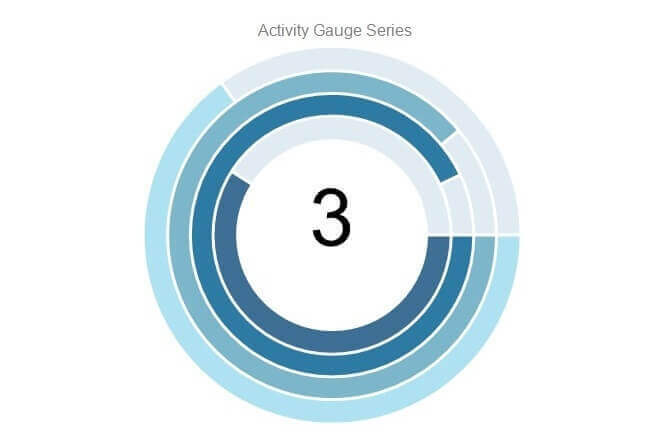 Supports multiple axes, both Horizontal and Vertical in the same chart. There is no limit to the number of axes in just the one chart. Live and animated zoom and scroll. Mouse wheel supported. Includes 16 predefined themes enabling rapid change of many chart properties with a single mouse click. Customizable colour palette, transparency, 3 color gradients, gray-scale. 2D, 3D plus OpenGL 3D with 360º rotation, lights and shadows. Custom drawing canvas. Support Forums provide browsable answers to thousands of users’ questions. Optional Professional-level technical support gives the subscriber a priority support link into Steema. See the Software licensing contract to learn more about the use of TeeChart Pro VCL/FMX license. Includes demos, several hundred of coded Chart examples, User Guide, Tutorials, blog articles, TeeChart wiki, etc. Issue Tracker offers an interactive way of entering and monitoring TeeChart issues. Compare features between the Standard version included in RAD Studio, the commercial Standard and the Professional version via the Feature Comparison table. Users of free TeeChart version included in Delphi and C++Builder are NOT eligible for an upgrade price. They are required to purchase a Developer License.